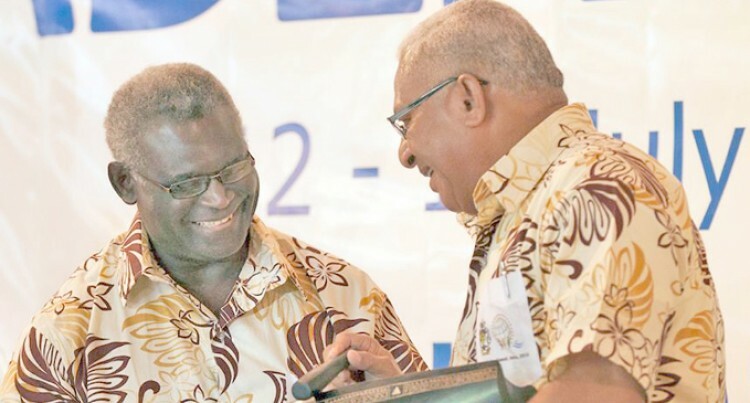 Solomon Islands Prime Minister Manasseh Sogavare is the new chair of the Pacific Islands Development Forum. Prime Minister Voreqe Bainimarama while congratulating Mr Sogavare on his appointment said he was handing over the reins of the forum with pride and confidence. “We are building for the future, and although our accomplishments may seem modest in comparison to our ambitions, we are moving steadily in the right direction. And that direction is definitely forward,” Mr Bainimarama said. “When I look back at the conception of this forum, how it sprang from an ideal and faced no small amount of opposition, I marvel at what we have been able to accomplish. “We began with the idea that we should seize control of our development and find an inclusive and sustainable way to prosperity. It was that simple. “And over the past three years, we have reaffirmed and consolidated its purpose through our actions, and we have convened leaders and citizens in open and inclusive dialogues that are aimed at solving problems. He said he was proud that through the Forum, they had achieved tremendous solidarity in advocating vital interests to the rest of the world.